A trilemma is a difficult choice posed by three options. It can be a choice among three favorable options, only two of which are possible at the same time. The Construction Trilemma, which faces almost all institutions that build, involves three choices. These choices can be thought of as dials, where your hands can only be on two dials at a time. The third dial will move in response to the others. 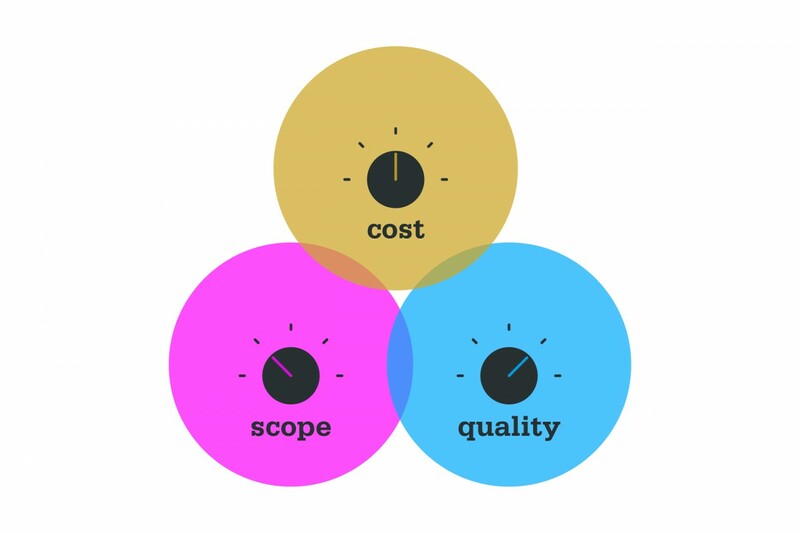 In construction projects, the three dials are Scope, Quality, and Cost. For example, as the Scope of a project increases, two choices remain – either the Cost must increase or the Quality must decrease. You can’t have your hands on all three dials at once. The most common problem facing institutions is that of a fixed first Cost, leaving either Scope or Quality as the remaining choices. Often times, the Scope is the first dial to grab, but the Quality dial can only be turned down so far. Basic life safety and building codes pose a legal threshold that place a limit on the Quality dial. It can only be dialed down so far. For a mathematician, this trilemma can be represented by the Euler diagram above, where the possible dual choice is actually represented by an overlap of domains. On many projects, an impasse is reached where there is a need to turn a dial that just can’t move. If you find yourself in this situation, what can you do? If you’re in the midst of a traditional Design-Bid-Build project, where the trilemma appears relatively late in the project – such as during the Bidding and Negotiations phase – the options are few. There is little choice other than to embark on a costly or acrimonious redesign where almost no one will walk away happy. A better scenario is to find yourself at an impasse in a non-traditional project, where the Owner, the Architect, and the Contractor are working as a team early in the process. This arrangement can capitalize on a front-loaded design effort, where tools such as BIM (Building Information Modelling) can provide oodles of data about a contemplated project early in the design process so that the Contractor, along with many subcontractors, can comprehend the structure imagined by the design team and accurately estimate the resources, time, and risk required. If an impasse is reached during the early design phase of a non-traditional project, the Scope and Quality dials can still be turned before the majority of the professional fees are spent. The graphic above is an adaptation of Boyd Paulson’s curves first published in 1976. It summarizes the relationship between design modifications and their inherent cost. Early in the project, the ability to radically alter the project without wasting money is easy. But as the project progresses, especially after construction begins, the cost of design changes skyrockets due to the lack of competitive leverage and the interdependence of building components. Rarely can one element change without requiring a cascade of changes amongst many other elements. The graphic also includes a representation of the design team effort, which traditionally peaks during the laborious construction documentation phase. During this phase, many different disciplines work in parallel to coordinate and communicate intentions about the final design. The trouble with this traditional arrangement is that most of the fee is spent after the cost of changes becomes expensive. The non-traditional process, sometimes associated with Integrated Project Design, is also shown. The slide forward is facilitated by early communication between Owner, Architect, and Contractor and the benefits of BIM, allowing costs to be validated before the design changes result in wasted money. Involving a Contractor early on strikes many Owners as foolish, since their incentive to be competitive vanishes after being annointed. However, since most general contractors self perform relatively few trades, if any, multiple contractors can be interviewed before the project launches and competitive fee structures compared. Assurances can be obtained that at least three competitive bids will be obtained for each trade to ensure that the project receives the full benefit of the marketplace. Ultimately, the Contractor will be assembling bids from subcontractors couched on assumptions of time, resources, and risk. Limiting risk is the key to obtaining the highest value for every dollar spent. That will be a subject of a future post.